This recipe is adapted from the Leon restaurant recipe book. We have this every week, usually with salmon or sausages. I make a bit extra so there’s some in the fridge for lunch the next day. Quinoa (pronounce keen-wah) is high in carbohydrate, and has a slightly nutty taste and makes a nice change to rice or cous cous. Unusually for a non-meat/dairy food it contains complete protein, which means it as all the amino acids, which are the building blocks of protein. It’s a myth that it’s high in protein. 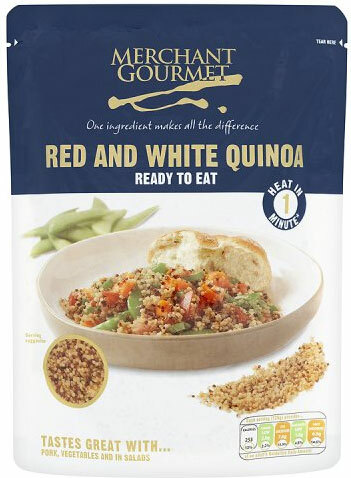 As a comparison, quinoa has about 8g/100g, while most meat has about 20-30g/100g. 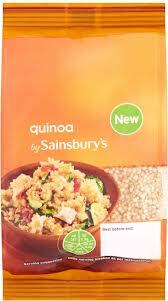 Quinoa can be bought in most supermarkets. ready to eat or dried. If you buy dried (much better value) then you need to cook it by putting in a saucepan with enough cold water to cover it, bring to boil, then simmer for about 20 minutes with the lid on, keeping on eye on it so it doesn’t dry out. 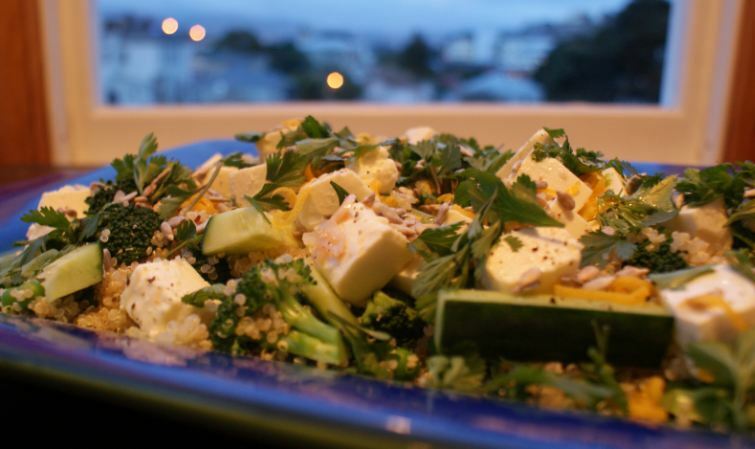 Leave the feta out, and add extra veggies. It will lower the protein content of the recipe, but if you’re having it with a portion of fish/chicken/meat etc. this won’t matter. Oil has 100kcal per tablespoon, so you can either reduce the olive oil to 1-2 tbsp, or just use lemon juice on it’s own. So here’s the recipe. Just toss the ingredients together and mix in the dressing!